What stood out was what a throwback the show seemed to be, with a style like that of the early ‘80s World Wrestling Federation. Like the old WWF, now WWE, everyone had a ridiculous character, and the show felt fun. There was nothing too serious on it, like we’re inundated with today. The Farmer’s Daughter was in a feud with a girl who claimed to be from the Jungle, which is a hell of a lot different from Brian Pillman pulling a gun on Steve Austin on Raw; and whatever the hell Vince Russo was doing at the time with WCW. WOW had cred, too. It wasn’t some fly-by-night operation. David McLane, the mind behind the original GLOW, was behind this new WOW. And Bobby Heenan called their pay-per-view, “WOW Unleashed” alongside legendary WCW announcer, and voice of Tony the Tiger, Lee Marshall. And then, WOW vanished. There were other “seasons” released in the ensuing 19 years in the wilderness, but unless you were looking for those episodes, you couldn’t easily find it, or stumble across it randomly, the way a lot of people did when WOW first appeared on television. WOW had gone off the air just before the explosion of social media that’s helped fuel the 24/7 connected world of wrestling that we’re all enjoying today. That is, until this past Friday, when a revamped WOW debuted on AXS-TV. The episode keeping all of the things that made the original version, and its predecessor GLOW, great. While somehow, in 2019, also giving the show a fresh presentation that’s on par with anything WWE cranks out that’s not Raw or SmackDown. I don’t have the word count available to go into everything I loved about WOW’s debut, but I’ll give you some of the highlights. But WOW has their characters bumping into each other backstage in every which way that’s fun without making you do all the work of having to follow everyone’s story. Professional wrestling on television, when it’s at its best, feels a little bit like The Muppet Show backstage, where anything can (and absolutely should) happen to keep you watching beyond just what you’re seeing go down in the ring. One of the worst things about being an Impact Wrestling fan is the terrible creative. There are some bright spots (Allie, Rosemary, and Su Yung for example), but Impact does an awful job of getting you to care about most of their characters. Kiera Hogan is a great example. Supremely talented, on Impact, Kiera had little to do other than be Allie’s friend, and it felt like she was shoehorned into the storyline just to give her something to do. 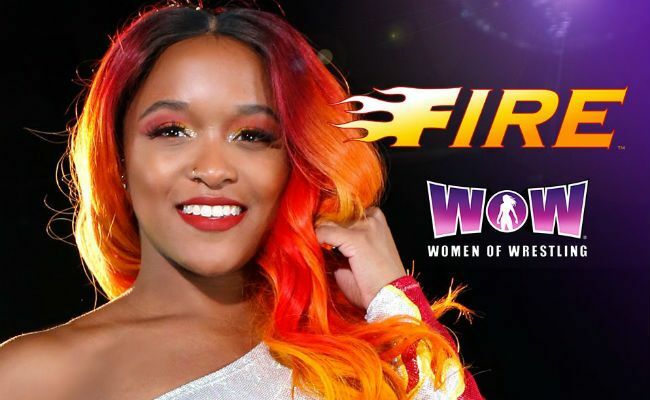 But on WOW, rebranded as Fire, Kiera got a video package explaining her origin, and then a spotlight match that showed off how talented she truly is. In less than ten minutes, WOW took a very talented performer that no one really cared much about on Impact, and turned her into someone everyone now wants to cheer for. It can be hard to write a weekly televised wrestling show, sure, but you should never have characters appear on camera who are “just there” and don’t have a character or story of their own. If Creative doesn’t care about the performer, why should we? Clearly, WOW cares about all of their performers. Santana Garrett and Jungle Girl also got terrific video packages in this episode, giving both performers wonderful character depth and detail in describing their motivations. Most televised wrestling shows today feature a lot of bloat. Overlong segments where wrestlers have to remember corporate-approved soundbytes, segments where some wrestlers, who may not be too comfortable acting, have to act in a segment that then completely falls apart. Sometimes you get a match that’s clearly meant to be the bathroom break (looking at you, Lucha House Party.) But there’s none of that excess with WOW. The show is just under an hour in length, and I found it hard waiting for an opportunity to get up and leave my seat to get a snack while the show was on. Everything flows seamlessly from one segment to the next. The action in the ring is great, which should be obvious to all, given that Tessa Blanchard, Santana, Kiera, Jessicka Havok, Holidead, and many other very talented performers have been brought in. It’s a tight show. Tighter than NXT some weeks; and in today’s wrestling landscape where everything feels way longer than it needs to be, the under one hour run time, the tight editing, and the quick pace of WOW is a breath of fresh air. Let’s not forget to mention the important, minor details that are all but forgotten in many other promotions. Each WOW match is announced to have a ten-minute time limit, which adds to the show’s drama. I don’t know what the future holds for WOW, but we should all wish it nothing but success. Women’s wrestling has never been hotter, and WOW presents a slickly edited platform for the performers, coupled with great creative, that will really help everyone shine.